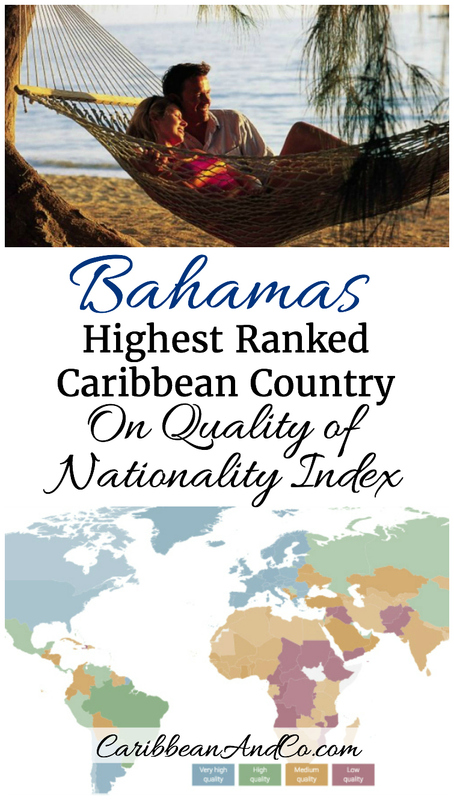 Bahamas Highest Ranked Caribbean Country on Quality of Nationality Index - Caribbean & Co.
Of the 16 independent Caribbean countries included in the first edition of the Henley & Partners – Kochenov Quality of Nationality Index, The Bahamas ranked the highest at 48th position. Overall, 161 countries from across the globe are included in the ranking that was officially released in Switzerland on June 2nd by Christian H. Kälin, Chairman of Henley & Partners a global leader in residence and citizenship planning. Kälin was joined by lead researcher for the nationality index Professor Dimitry Kochenov who is Chair in European Union Constitutional Law at the University of Groningen, Visiting Professor of the College of Europe and Chairman of the Investment Migration Council. Henley & Partners – Kochenov Quality of Nationality Index – Map showing rankings across the globe. Photo Credit: ©Henley & Partners. The next Caribbean country on the Henley & Partners – Kochenov Quality of Nationality Index is Barbados ranked 51st followed by Antigua & Barbuda ranked 58th. These top three are then followed by St Kitts & Nevis ranked 59th, Trinidad & Tobago ranked 78th, and Saint Lucia ranked 86th. All Caribbean countries including lowest ranked Haiti at 140th position are considered Medium Quality – nationalities with a value of between 20.0% and 34.9%. The methodology for the Henley & Partners – Kochenov Quality of Nationality Index which will no doubt become an important tool for those wanting to retire to the Caribbean and for ultra high net worth individuals evaluating citizenship programs like those offered in the Caribean reviewed data for the last 5 years and looked at both external and internal factors. Henley & Partners – Kochenov Quality of Nationality Index – internal and external factors. Photo Credit: ©Henley & Partners. For the internal factors, they looked at the economic strength of the country via International Monetary fund data, the scale of human development via the United Nations Development Programme Human Development Index and the level of peace and stability via Global Peace Index published by the Institute for Economics and Peace. Interestingly, tax regulations which would most likely improve the ranking for most Caribbean countries was not included because according to Professor Dimitry Kochenov this is a matter for the State which is separate from nationality which plays a significant part in determining our opportunities and aspirations. With regards to external factors, they looked at the number of countries to which visa-free travel was available for persons of a particular nationality as well as ease of living and working in other countries. Higher weight was awarded to countries deemed more desirable for visa-free travel and resettlement. 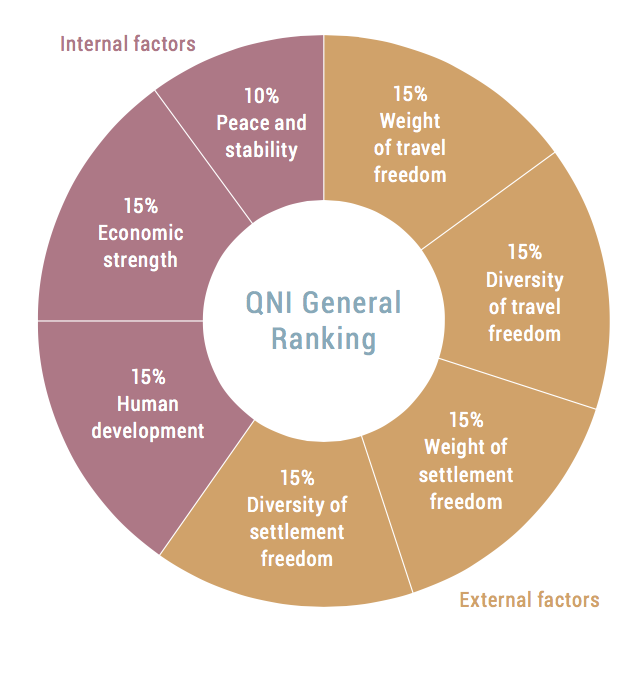 Thus, no surprise that countries with Caribbean dependent territories were all ranked higher — in fact, they are all in the first tier and their nationalities considered: Very High Quality as they have a value of 50% and above. The ranking for the United States is the lowest for those countries with Caribbean dependent territories despite having the largest economy in the world and ranking well for human development. However, this is due to its low score for peace and stability due to its nuclear arsenal and continual involvement in armed conflicts. The United States also received a low score due to complexities and difficulties of its citizens living and working elsewhere in the world. This is unlike France, The Netherlands, and the United Kingdom, who are part of the European Union (28 countries) and European Economic Area (31 countries), which have full reciprocal access. This resulted in all European Union countries (even Romania and Bulgaria) ranking above the United States. Important to note here that for Caribbean countries, the lower score on the majority of sub-elements and the lack of significant settlement freedom prevents even the top-ranked nationalities from matching the score for most European, North American and some of the East Asian nationalities. Thus, while being a dependent territory has it challenges, it could be considered a bonus for those in the Caribbean who are blessed with this extended nationality and ultimately travel with a passport from France, The Netherlands, the United Kingdom and the United States. So what can independent Caribbean countries especially those like Saint Lucia that recently launched a Citizenship By Investment Program do to improve their nationality ranking? Well, Professor Dimitry Kochenov suggested that governments should focus on internally improving the rule of law, being more friendly with neighbors, negotiating visa-free travel for their citizens to more countries and being a more active participant in regional and international economic and governmental associations. For more information, visit the website for the Henley & Partners – Kochenov Quality of Nationality Index which ranked the German nationality the highest in the world over the last five years with a score of 83.1% and The Democratic Republic of Congo as the lowest in the world with a score of 14.3%. The Bahamas – Couple in a hammock on the beach. Photo Credit: ©Bahamas Tourism Office.